Browse through our full listing of current and upcoming events, or click on any title to jump down to further information on that event. 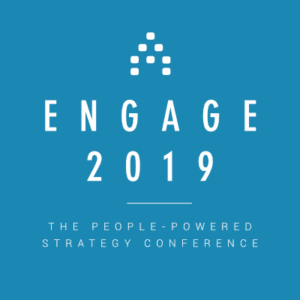 Engage is the conference that values execution over theory – and people over ideas. Unlock the power of your strongest asset and build an organization that is passionate, single-minded and relentless in the pursuit of its goals. At this conference, Point Road Group’s Alyssa Gelbard will present How Incorporating Personal Brand Strategy Strengthens Your Corporate Brand. Corporate brand strategy is part of business strategy and contributes to successful company growth. Aligning all areas of business in how the organization is represented to current and potential clients, strategic partners, investors, employees, vendors etc., is crucial. A strategic approach for alignment helps build/grow market presence, differentiate from competition and connect to stakeholders. An important extension of corporate branding is how members of the business, particularly the leadership team, represent themselves in the context of the company brand. Attention to personal brand strategy is often absent, and this can undermine the effectiveness of the business strategy. If executives and visible leaders lack personal brand presence, neglect to adopt corporate brand messaging and/or don’t communicate their own value clearly, this lack of cohesion can negatively influence key corporate impressions and business decisions. Leveraging expertise in helping individuals and organizations with brand strategies, this session will explore the difference between a personal and corporate brand and how to develop a personal brand strategy that augments the corporate one. Leaders will learn how to strengthen their personal brands, both in-person and digitally, ultimately to improve corporate brand presence and business effectiveness. Friends of Point Road Group receive $200 off registration for this conference using code ENGAGE200ALYSSA at checkout.